Global Handwashing Day was launched on October 15 in Freetown and in the district headquarter towns, inviting children from schools and high level political representatives. The event included float parades by school children and NGO partners, drama skits and launch ceremonies culminating in a mass handwashing with soap event. About 200,000 children and 500 mothers were reached throughout the country with the celebrations which aimed to generate a buzz around handwashing with soap and serve as the catalyst for initiating a nationwide handwashing with soap campaign in Sierra Leone. 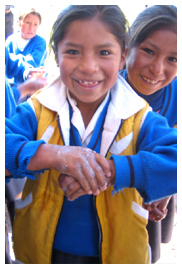 Holistic communication elements included: posters, stickers and T-shirts with handwashing with soap messages.